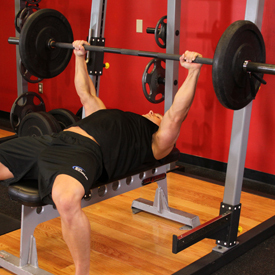 The king of all chest exercises is the flat barbell bench press. 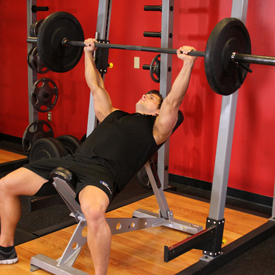 The flat barbell bench press has long been the standard for overall upper body strength. If you could only choose 3 exercise to create a full body workout, the flat barbell bench press would have to be on the list. Here are the best chest exercises you should use. After a brief pause, push the bar back to the starting position as you breathe out. Focus on pushing the bar using your chest muscles. Lock your arms and squeeze your chest in the contracted position at the top of the motion, hold for a second and then start coming down slowly again. 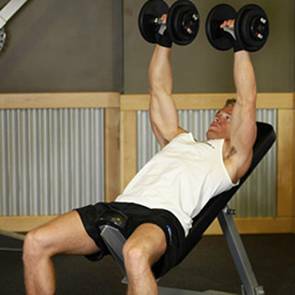 Tip: Ideally, lowering the weightshould take about twice as long as raising it. Lie back on an incline bench. Using a medium-width grip (a grip that creates a 90-degree angle in the middle of the movement between the forearms and the upper arms), lift the bar from the rack and hold it straight over you with your arms locked. This will be your starting position. As you breathe in, come down slowly until you feel the bar on you upper chest. After a second pause, bring the bar back to the starting position as you breathe out and push the bar using your chest muscles. Lock your arms in the contracted position, squeeze your chest, hold for a second and then start coming down slowly again. Tip: it should take at least twice as long to go down than to come up. Caution: If you are new at this exercise, it is advised that you use a spotter. If no spotter is available, then be conservative with the amount of weight used. Also, beware of letting the bar drift too far forward. You want the bar to fall on your upper chest and nowhere else. 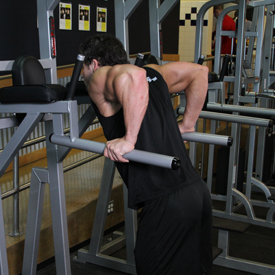 Variations: You can use several angles on the incline bench if the one you are using is adjustable. When you are done, place the dumbbells back on your thighs and then on the floor. This is the safest manner to release the dumbbells. 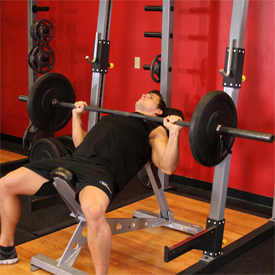 Variations: You can use several angles on the incline bench if the bench you are using is adjustable. Then, using your thighs to help raise the dumbbells up, lift the dumbbells one at a time sothat you can hold them in front of you at shoulder width. 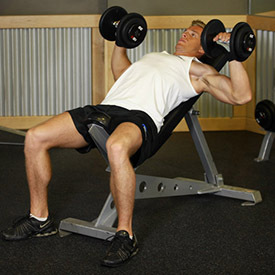 Then, as you breathe out, use your chest to push the dumbbells up. Lock your arms at the top of the lift and squeeze your chest,hold for a second and then begin coming down slowly. Tip: Ideally, lowering the weight should take about twice as long as raising it. Repeat the movement for the prescribed amount of repetitions of your training program. Caution: When you are done, do not drop the dumbbells next to you as this is dangerous to your rotator cuff in your shoulders and others working out around you. Just lift your legs from the floor bending at the knees, twist your wrists so that the palms of your hands are facing each other and place the dumbbells on top of your thighs. When both dumbbells are touching your thighs simultaneously push your upper torso up (while pressing the dumbbells on your thighs) and also perform a slight kick forward with your legs (keeping the dumbbells on top of the thighs). By doing this combined movement, momentum will help you get back to a sitting position with both dumbbells still on top of your thighs. At this moment you can place the dumbbells on the floor.